It's the most wonderful time of the month and NO I'm not talking about Mother Nature's monthly gift. 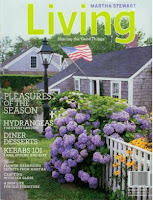 I'm talking about the day each month when I receive the newest issue of Martha Stewart Living. September's issue came in the mail yesterday. I have a ritual when I get a new "Martha" (as I affectionately call my MSL magazines). I go into my room, close the door (no kids allowed), snuggle up with a nice cup of coffee and slowly flip through all the pages. My family is starting to learn that this is "my time" and that they probably better not interrupt unless someone loses a limb. I absolutely love Martha Stewart. She is the inspiration behind domestically inept. Its me....trying (and failing) to be Martha Stewart. 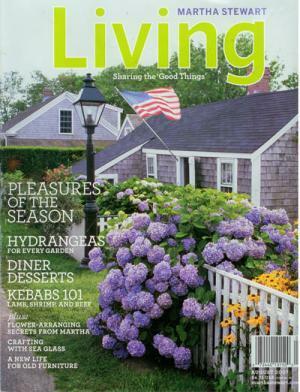 Even if you're not a crazy Martha Stewart freak like me, I think you could still benefit from her magazine. Unlike most junk magazines out there....Martha Stewart Living is full of very practical information. Recipes, cooking and cleaning tips, gardening and craft information. And don't get me started on the photography. The pictures alone are worth the subscription. I get so much inspiration from my Marthas. I only started subscribing a few years ago and have since started buying back issues. I periodically go through some of them and every time I pick up an issue, no matter how many times I've looked at it, I still learn something new! The subscriptions are usually pretty reasonably priced and they make wonderful gifts! So if you haven't discovered Martha....I suggest you do.